Brugge (Belgium) is known as the “Venice of the North” is an enchanting city. 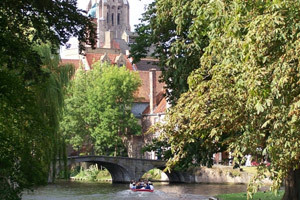 During the drive through the north of France your guide will initiate you to the history of this region before arriving in Belgium and discover Brugge where you will have a pedestrian guided tour of the old city to visit : the "Beguinage " Covent, the Place du Bourg with the Saint Sang Basilica, the gothic style town hall and finally the maginificent Grand Place its quaint houses with decorated facades and the "Halles" indoor market with a belfry. After this visit you will have free time to discover this jewel of architecture, its picturesque canals and narrow streets, the bell tower. Lunch is not included in this tour, but your guide will recommend a restaurant if you wish to. A passport is required for this trip. Included in this tour round trip transportation between Paris and Brugge, guided visit of the old town, cruise on the canals and free time to explore the Venice of the north. RETURN = To your accommodation.